Doctor Who: Looking Back At COLD BLOOD | Warped Factor - Words in the Key of Geek. Christopher Morley wraps up our week long Silurian study with Cold Blood. Cold Blood sees the Silurains persuaded to go into underground hibernation once more following diplomatic talks with esteemed representatives of those whose planet they wanted back. It's a massive step forward considering the enormous failure of the last attempt at mediation between the two races at Wenley Moor. Just as the Doctor's earlier self was often to be found bemoaning the limitations of the military mind, with his ire directed at his old friend & former boss Brigadier Lethbridge-Stewart, the man he has become now finds himself dismayed at the heavy-handed approach of Restac, one of homo reptilia's commanders. DOCTOR: Hello. Who are you? DOCTOR: Oh dear, really? There's always a military, isn't there? MALOHKEH: Your weapon was attacking the oxygen pockets above our city. DOCTOR: Oxygen pockets, lovely. Ooo, but not so good with an impending drill. Now it makes sense. RESTAC: Where is the rest of your invasion force? DOCTOR: Invasion force. Me and lovely Nasreen? No. We came for the humans you took. And to offer the safe return of Alaya. Oh wait, you and she, what is it, same genetic source? Of course you're worried, but don't be, she's safe. RESTAC: You claim to come in peace, but you hold one of us hostage. DOCTOR: Wait, wait, we all want the same thing here. RESTAC: I don't negotiate with apes. I'm going to send a clear message to those on the surface. Scientist Malohkeh disagrees with her tactics. "This isn't the way." And he's quite right! But surely democracy will never triumph with a gun-toting Eocene standing in its way? MALOHKEH: All right, Restac, you've made your point. RESTAC: This is now a military tribunal. Go back to your laboratory, Malohkeh. And an elder, Eldane, is another progressive thinker- able to see a future in which man & Silurian can live together. ELDANE: Stop! You want to start a war while the rest of us sleep, Restac? RESTAC: The apes are attacking us. ELDANE: You're our protector, not our commander, Restac. Unchain them. RESTAC: I do not recognise your authority at this time, Eldane. ELDANE: Well then, you must shoot me. RESTAC: You woke him to undermine me. MALOHKEH: We're not monsters. And neither are they. RESTAC: What is it about apes you love so much, hmm? MALOHKEH: While you slept, they've evolved. I've seen it for myself. Perhaps there is hope for a peaceable solution, however un-Doctor Who-like that may be! Perhaps the Time Lord is still haunted by the memory of the awful battle he'd witnessed aboard the Sea Base seven selves ago. "Oh, that's much better, thanks. Not got any celery, have you? No. No, not really the climate. Tomatoes, though. You'd do a roaring trade in those." And with that, the possible seed of a future move into the greengrocers' trade is planted in Malohkeh's mind. It'll have to wait until after he's served as physician to the Holy Roman Emperor - one Winston Spencer Churchill! Perhaps this is the other way the Fifth Doctor had been so keen to find? "Okay. Bringing things to order. The first meeting of representatives of the human race and Homo Reptilia is now in session. Ha! Never said that before. That's fab. Carry on." The sort of debate Question Time must wish it could snaffle then commences. AMY: So, what about the areas that aren't habitable to us? Australian outback, Sahara desert, Nevada plains. They're all deserted. NASREEN: Yes, fine, but what happens when their population grows and breeds and spreads? And anyway, what benefit does humanity get, and how will we ever sell this to people on the surface? ELDANE: If I could get a word in, maybe I could tell you. You give us space, we can bring new sources of energy, new methods of water supply, new medicines, scientific advances. We were a great civilisation. You provide a place for us on the surface, we'll give you knowledge and technology beyond humanity's dreams. If we work together, this planet could achieve greatness. NASREEN: Okay. Now I'm starting to see it. DOCTOR: Not bad for a first session. More similarities than differences. Which concludes with the Silurians sent "back to their rest, on the promise of future harmony with humans" and raises the question of what happens when "my people awaken from their thousand year sleep ready to rise to the surface". After all the Doctor is now a very different man from the one the species had known at the various stages of both its own and his evolution, which surely raises the possibility of future re-acquaintance? "No, wait, wait, please. In an earlier regeneration you knew me as the Doctor." DOCTOR: You can't just change what I look like without consulting me! TIME LORD: You will have an opportunity to choose your appearance. DOCTOR: Oh, well, that's not so bad. But I warn you, I'm very particular. And after subsequently refusing all the alternatives to his then current trendy scruffbag mop-top look, he's given a new one and packed off to get a real job with UNIT. One of his earliest assignments being to take a look at the Silurians for the first time! 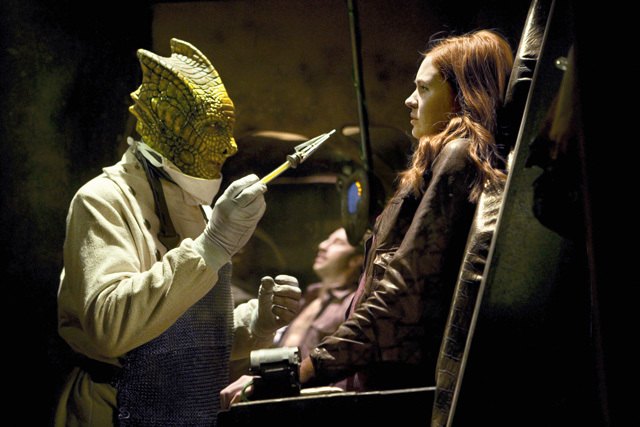 SILURIAN: Why do you want to help us? DOCTOR: Because I want there to be peace between you and the humans. This is their planet now. 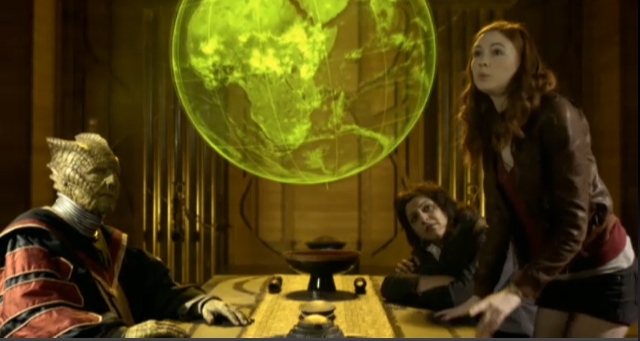 SILURIAN: This planet is ours. It always has been. But would he be so favourably disposed toward them following ten regenerations and a possible change in outlook?